Amritsar is a site of pilgrimage for many Indians. 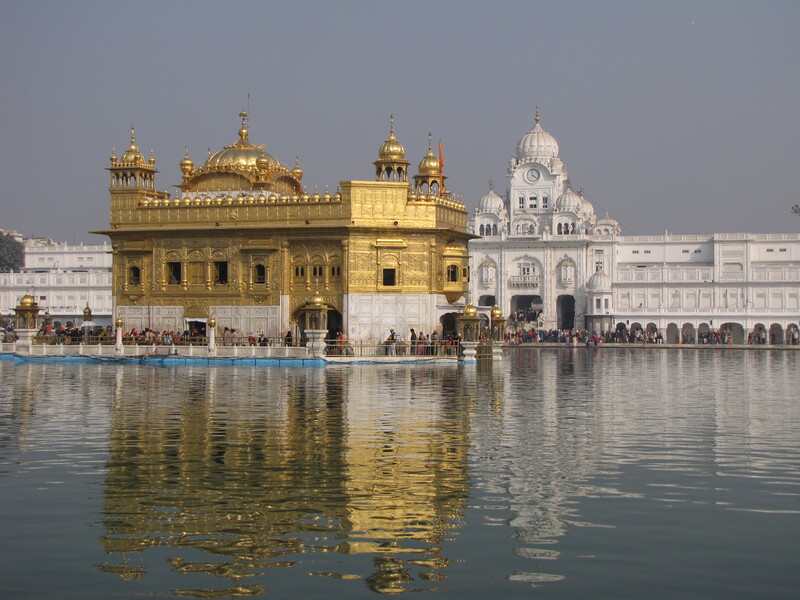 The city of just over a million people is the home of the Golden Temple, the holiest shrine of the Sikh religion. Sikhs come here to make offerings and prayers and to bathe in the holy waters surrounding the temple. But Amritsar is also a place of political pilgrimage. 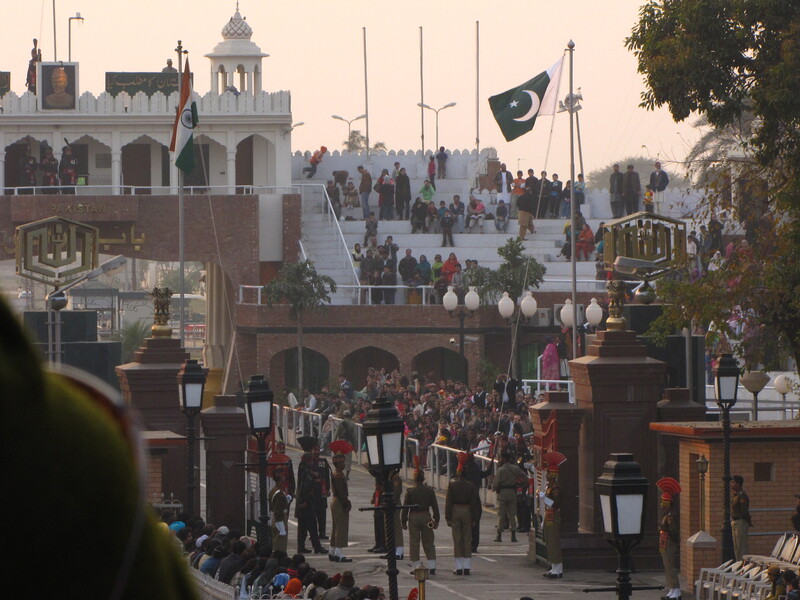 Only an hour’s drive from India’s only land entry point into Pakistan, thousands of people visit the border at sunset each day to watch the ostentatious display of military pageantry that occurs when the border closes for the day. So, we went to Amritsar to see what all this was about. Before you enter the Golden Temple, you must remove your shoes and socks, cover your head and wash your feet. You walk down a set of steps on to a white marble portico. The first thing you see is the large water reservoir surrounding the beautiful, but small Golden Temple at the center of the reservoir. Thousands of believers are there, bathing in the holy waters of the reservoir, sitting along the walkways reading Sikh holy texts, and making holy offerings at the temple. The Golden Temple also has a huge, free dining hall in an adjacent building. It is a tradition in Sikhism to provide a free meal for all people at its gurdwaras. The dining hall at the Golden Temple reputedly provides between 60,000 and 80,000 free meals per day. The hall feeds people in groups of probably 2,000 at a time. Everyone comes in and sits in rows along long mats on the floor. A guru comes in and says a prayer, and then workers start walking down the aisles distributing food. First, a volunteer comes along with a big basket and (literally) tosses you two chapattis. Then, another guy comes along, with a large bucket and a ladle, and spoons out a portion of dal on each plate. More buckets, containing a vegetable curry and sweet rice, come later. The volunteers continue circulating, offering seconds of everything, as people frantically eat. When a guy starts dumping water on the floor, that’s the cue to start leaving. More volunteers enter the aisles with mops and start getting ready for the next group. Although the service is perfunctory and getting your food from a bucket seems a bit unappetizing, the food is very good and the experience is unique. It’s probably the only pilgrimage site in India where you can sit and take a meal with the pilgrims, be welcomed and included and not feel entirely like an outsider. After leaving the Golden Temple, we arranged a ride to the border. When we got there, we found thousands of people waiting for the security checkpoints to open. It’s a truly Indian experience. People coming to the border closing ceremony must go through a series of security checkpoints, and they must divide into separate queues according to gender. Apparently the experience in the women’s line is much different from the experience in the men’s line. At least partially by virtue of her blonde hair, Kara was adopted by an Indian family that spirited her through the long lines and the chaos. I, on the other hand, was pushed and jostled on all sides, by Indian men stampeding their way to the front. It was particularly hilarious when the entire men’s section – six or seven “lines” consisting of several hundred people at that time – all had to push their way through a single metal detector. The Indian and Pakistani governments have built large grandstands around the border post for people to come view the goosestepping. Although there were lots of empty seats on the Pakistani side, the Indian side was packed, with people standing and crouching in the aisles. The border closing ceremony is a bit like a football game; the Indian side has a guy whose job is to get the crowd going. He screams chants like “Hindustan zindabad” (which means “Long live India”) into a wireless mic while the soldiers march back and forth with extremely high leg kicks. At certain points, a soldier would march up all the way to the Pakistani side and pump his fists and arms in the air. This would elicit a huge roar from the Indian side. The whole thing is a bit bizarre. These are two countries that have very real tensions between them. Both are nuclear powers. Yet, here they meet every day to taunt each other across the one crossing they allow between them. And citizens on both sides eat the whole thing up.